WINNER TAKES ALL: Deacon-Jones accepting her cash prize from the JCDC's Orville Hill and Culture minister Olivia 'Babsy' Grange. WEEKS and weeks of countless rehearsals and detailed preparation culminated inside the National Arena on Sunday night, as the most outstanding entrants in this year’s National Gospel Song Competition were honoured by the Jamaica Cultural Development Commission. 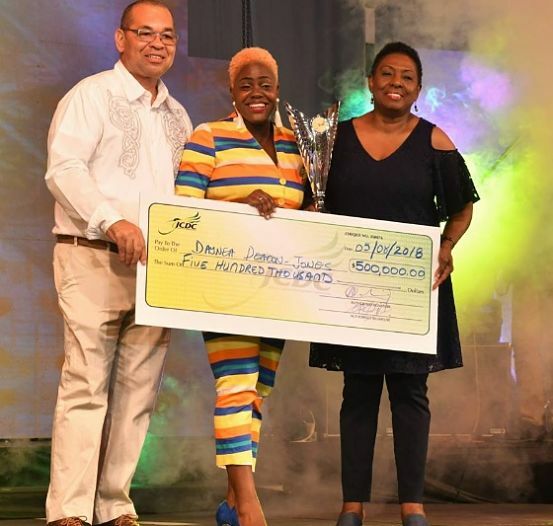 Daynia Deacon-Jones, a full-time teacher at Campion College, was declared the winner, taking the top prize of $500,000, a trophy and a handful of gift packages. Jones won for her tuneful spiritual anthem, “Worshipper’s Heat,” for which she also copped the sectional prize for Best Musicianship. A very large crowd, including government ministers Olivia ‘Babsy’ Grange and Alando Terrelonge, and JCDC officials, were on hand to witness the wonderful performance package and the awards presentation that followed – ably emceed by Markland ‘Action’ Edwards. Nigerian-born singer-songwriter Adeoluwa Adeoye (St. Catherine), who has been residing in Jamaica for the past two years, came in third with “You Oh Lord” and was awarded $250,000. For a song (“God’s Coverage”) penned by Nigel Powell, the musician brother of Asafa Powell, second place went to vocalist Dwight Ferrari, who took home $350,000 and the sectional prize for Best Performance. Among the other sectional prize winners: Travis Dean Allen, “End of All Things is at Hand” (the Spirit of Praise Award); Shaundre Cowan, “Worship – Victory Edition” (Best Lyrics, Best Arrangement) and Joelle Notice (Most Popular on Social Media). Backed by the Evolution Band and One Accord Singers, opening performances came from 2017 winner Shaughna-Lee Steele and 2016 champ Marsha Jarrett. Prodigal Son, giving a high-energy set, was the show’s guest performer.